IAN McAULEY. Don’t rush to endorse the National Energy Guarantee: There’s an election in a few months. The best outcome for electricity consumers would be for state governments to kill the National Energy Guarantee when the COAG energy council meets on Friday. Having gone nine years without a well-grounded energy policy we can wait a few months until the next election. As Greens leader, Richard Di Natale said on the ABC Breakfast Program, the NEG is a set of arrangements “designed to get through the Coalition Party Room”. The government’s claim is that the NEG will bring down prices, improve reliability, and almost as an afterthought, contribute to reducing emissions from the electricity sector, but the published work of the Energy Security Board (the government body supporting the NEG) lends little support to these claims. “The average NEM-connected household is estimated to save around $550 dollars a year (real $ 2018) on their retail bill over the 2020s relative to 2017-18. Of this, nearly $150 per year (real $ 2018) is forecast additional savings as a result of the Guarantee”. In other words, most savings would come about anyway, and when one digs into the ESB Report and its associated spreadsheets, one finds its full $150 savings don’t kick in until 2025-26. Unsurprisingly the ESB’s claims of price reductions have been disputed. In a report prepared for Greenpeace the consulting from Reputex has claimed that any savings foreseen under the NEG would be modest, because its unambitious emissions target would discourage investment in low-cost renewables. Under a more ambitious 45 per cent emissions reduction target, rather than the 26 per cent target in the NEG, competitive pressure from renewables would result in wholesale prices being $20 per Mwh lower. And to add to the debate, Tony Abbott has said prices under the NEG wouldn’t fall and the modelling cannot be believed. With rapidly-falling prices of renewables and storage, it is folly for anyone to be making firm predictions of prices to 2030. The simple fact is that electricity prices in Australia have doubled over the last 15 years, going from some of the world’s lowest to some of the world’s highest, and there is nothing on the horizon that would result in bringing prices down in any hurry, because nine years of policy uncertainty have resulted in inadequate investment in new electricuty capacity. The graph below shows the electricity price index, adjusted for general inflation, up to June this year. 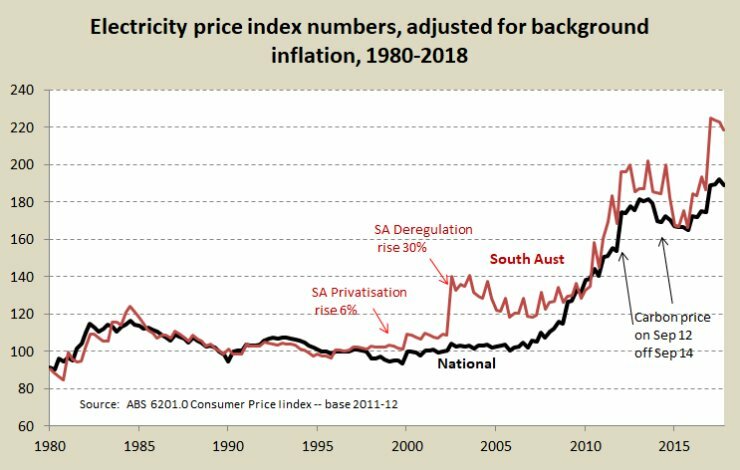 I have singled out South Australia in that graph because it has had the highest rise in prices, and it now has the most expensive electricity in the National Electricity Market. These price rises, and some speculator blackouts in 2016 shortly after its only coal-fired station was decommissioned, have led to some wild claims among those who deny climate-change and those wanting to point-score against the then SA Labor Government (usually the same people). generation (wind and solar farms, coal and gas power stations), competitive, and comprising about a quarter of your bill. To emphasize the point, only about a quarter of your bill relates to the cost of producing electricity. That’s why, as can be seen in the graph, Gillard’s modest and short-lived carbon tax was no more than a blip: inflation-adjusted prices are now higher than they were when the tax was in operation. The big cost rise has been in transmission and distribution. Some of this was the result of an overdue upgrade in capacity, but most of it was a result of over-building ( “gold plating”) under a permissive regulatory regime that allowed companies a generous and guaranteed return on capital on as much as they could invest. The regulations have been tightened to ensure they do not over-invest, but the allowed return on capital is still generous. When in a draft determination last month, the Australian Energy Regulator proposed a modest cut in the networks’ generous allowed return on investment, the regulators protested loudly, and although electricity companies are wallowing down with the banks in surveys of public trust, the network companies look like maintaining their privilege. With the resources of years of high profits, they have a long history of successful legal challenges to the regulator’s determinations. In a world where the networks were allowed only a risk-free return on capital, or in a world which hadn’t been gripped by the fetish of privatisation, customer bills could be about 15 per cent or $250 lower. In spite of strong public support for bringing power companies back to public ownership (63 per cent support, 17 per cent oppose), re-nationalisation isn’t on the table. But the costs on which the NEG are focussed are the costs of generation. Our coal-fired power stations are old, and just as one can run an old car cheaply (if one is not too concerned about reliability or emissions) the power stations have been run at low cost to their owners. The Victorian stations and the recently-closed South Australian power station operated on coal of such low quality that it didn’t have any opportunity cost as might have been set in export markets, and coal’s biggest and rarely-challenged subsidy has been its exemption from a carbon price to cover the externalities of global warming and local health effects. 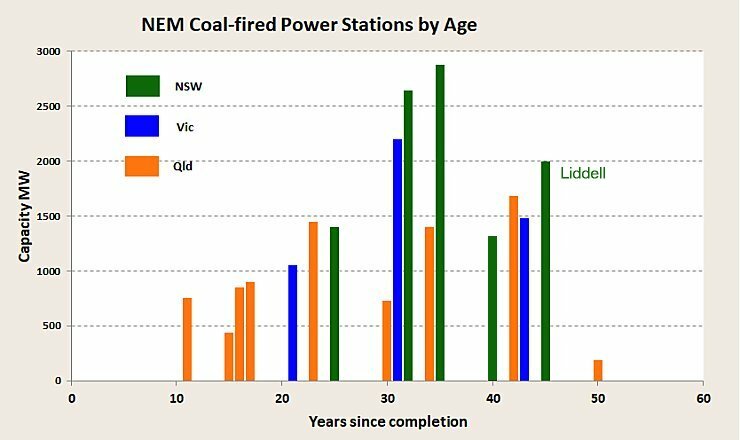 As can be seen from the graph above, Australia has a big chunk of coal-fired stations between 40 and 50 years old (including Liddell), and another big chunk in their thirties, and these old stations are not the most reliable. Whatever happens to the NEG on Friday, Australia is probably in for one or two summers where there could be interruptions to power supplies, particularly during peak periods. But if there are no impediments to renewable energy such shortages should be overcome faster with incremental additions to wind and solar than with the long lead time in building large so-called “base-load” stations. Our electricity supplies are suffering from a constellation of poor policies. The NEM itself is a large part of the problem: there was a case for separating generation into a competitive market, but structural separation, commercialisation and privatisation were ill-conceived policies. As a result we are now paying even more than we were paying under the carbon-price, but without the benefit to public revenue – revenue which could go some way to helping those worst affected by climate change, such as farmers. But by far the greatest problem has been the lack of clear and well-embedded policy, ever since Abbott knocked off then opposition-leader Malcolm Turnbull in 2009 because of his support for the Rudd Government’s Carbon Pollution Reduction Scheme. There is plenty of blame to go around – the Greens for their holier-than-thou rejection of the CPRS, the Rudd Labor Government for lacking the courage to take the CPRS to a double dissolution election and the Gillard Labor Government for its apologetic support for its own carbon tax, but the consistent wrecker has been Abbott, supported in recent years by a handful of political extremists in the Coalition. Those same wreckers are now at work, and even if the states agree in principle on Friday, they could still wedge the government into an impossible position. For Turnbull there is the option of offering a deal with Labor to get their parliamentary support for a plan with a responsible emission reduction target, a market-based price on carbon (rather than the weak de-facto price implicit in the NEG), public investment in the infrastructure to support low-cost, despatchable electricity, and development of strong demand-side markets and technologies. Abbott and his fellow wreckers would “cross the floor”, and no doubt the Murdoch Press would lampoon Turnbull and his ministers, but it would blindside Labor (they could hardly refuse), would give Turnbull his sought-after place in history, and would demonstrate that Australian democracy is not shackled by the stultifying conventions of the “Westminister” system. In the absence of such political courage the best outcome is for the states to declare the NEG “dead, buried and cremated”. We have borne the cost of nine years of a policy vacuum: surely we can bear another few months. Whatever happens in next year’s election, even an unlikely Coalition victory, it is highly unlikely that we will have the misfortune of a Parliament that can be held to ransom by economic and environmental vandals. 2 Responses to IAN McAULEY. Don’t rush to endorse the National Energy Guarantee: There’s an election in a few months. There are some useful truths in this article. Thank you. It may not be useful to conflate the Separation issues with future policy. It was a reasonable question whether governments shown own and operate all aspects of electricity at the time. That it might have been done better or worse matters not now; it is the reality we are faced with. Perhaps something could be done with distribution returns but this question probably would have arisen without the present ‘crisis’. It may be more profitable to look at whether government should be dabbling in this policy area at all. Governments are notoriously bad at ‘picking winners’ and most of the debate we are watching revolves around who supports what and how much of it. We need to be honest enough to say that the energy market has been knocked off balance by an international concern with climate change and very effective activism by climate campaigners in Australia. This campaign and the policy mess it has created means Australia is unable to utilise its generous resources of coal, gas and uranium despite the age old principles of national comparative advantage that created the modern world and despite the fact we sell our resource commodities to all comers. Surely there were, and are, better ways than the ideologically driven solutions that severely disadvantage citizens and business for a benefit that is only defensible on the basis of modelling that is, at best, suspect. Things change. We only have to look at communications technology to see that. We can only guess at what technology will produce in the next decades in terms of energy production. This week we saw how CSIRO may be on the brink of hydrogen technology to run motor cars. How that might change the emissions equation! I’m with you. Why not wait a few months? But not to adjust renewable targets or bribe parties into acceptance. No, we need a complete re-think, from the basics. Get rid of the distortions, the government induced pushing and pulling and work a solution in the overall national interest. A really good, informative article, Ian, but it’s unfair to lambast the Greens for blocking Rudd’s proposed $22 billion of free CPRS permits and 100 percent overseas carbon offsets that would have done nothing to reduce emissions. Nor is it fair or accurate to describe Gillard’s price on carbon as a “carbon tax”. That was Abbott’s misrepresentation and you shouldn’t repeat it! !